Welcome to the Eye Emergency Resource Pack!! 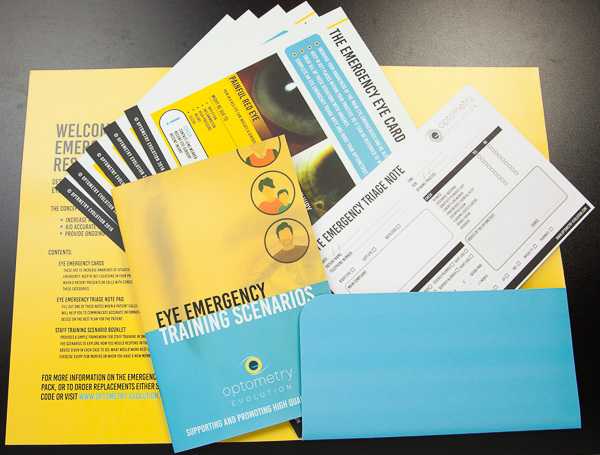 Following on from the popular Eye Safety Card, this resource pack has been developed as a comprehensive kit to help optometry support staff to respond to urgent and emergency eye conditions. Optometry practice support staff play a crucial role in frontline eye-care when patients present with urgent eye conditions. Members of the support team are almost always the first people that the patent will speak to when they present with a serious condition, so it is really important to help our support staff to recognise these serious situations and how best to respond to them. Effective work at this first point of patient contact should result in the patient being seen by the optometrist or appropriate professional at the earliest opportunity, giving the patient the best chance of receiving the correct treatment as soon as possible. This double-sided A4 card is designed to increase awareness of the main ‘red-flag’ signs and symptoms that may indicate an eye emergency. It covers the main broad categories such as Painful Red Eye, Sudden Loss of Vision, Injuries and more. It has a clear and easy to follow layout which can be referred to readily if a patient contacts with worrying changes with their eyes. These should be kept at key locations within the practice so they can be referred to easily and act as a visual reminder to staff to be alert to these situations. This A5 pad contains 50 triage recording sheets to provide support staff members with a clear and structured tool for gaining accurate information from the patient. They then pass this straight away to an optometrist for them to decide upon the best course of action in the situation. The form allows for the recording of up to date contact information, an area to describe the main complaint, description of the vision, pain and a checklist of other signs and features. There is a space for the optometrist to record their advice/instructions. If no optometrist is present in the practice it also provides some prompts as to other options for getting the patient reviewed urgently. This A5 booklet provides the basis for small group staff training sessions. This contains 12 brief patient scenarios that can be discussed in groups so that staff members can explore how they would respond to these scenarios. With each case there is some advice given as to how they might respond, however there is not always a single correct answer as it may depend on the type and location of practice you work in. A typical training session should maybe take 3 or 4 of these scenarios at a time, and chat for about 5 to 10 minutes on each. Read the scenario, discuss the questions raised in each case, then read the advice given. It would be useful to carry this out in the presence of an optometrist for guidance, but the main concept of the exercise is to prompt discussion from support staff. The Eye Emergency Cards and Triage Pads may also be used in conjunction with these training scenarios to help gain familiarity with using these elements of the resource kit. Ideally this short exercise could be carried out several times a year, and particularly when a new member of staff joins the practice. To order Eye Emergency Resource Packs for your practice, please visit the shop area of the website. The various elements of the pack can also be ordered separately as replacements or spares.